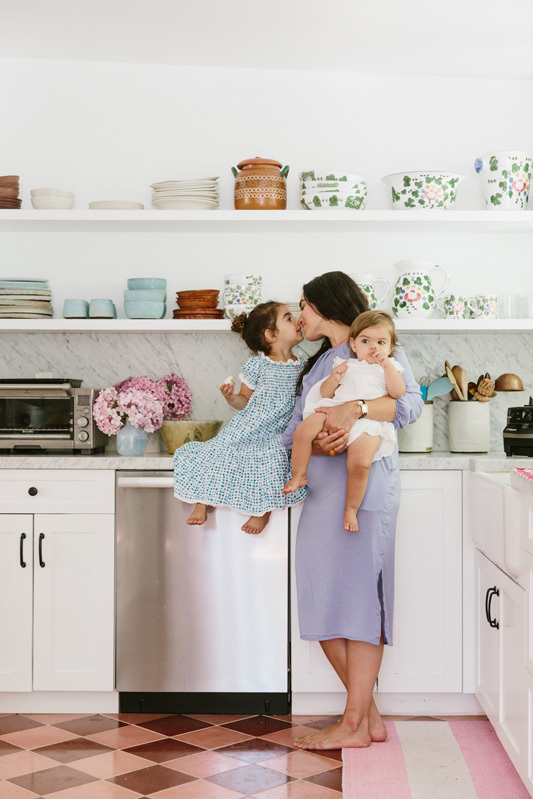 Heather Taylor seemingly has it all—a beautiful home, killer style, blossoming business, an incredible group of girlfriends, and a steady commitment to raising her girls thoughtfully in today’s turbulent political climate. 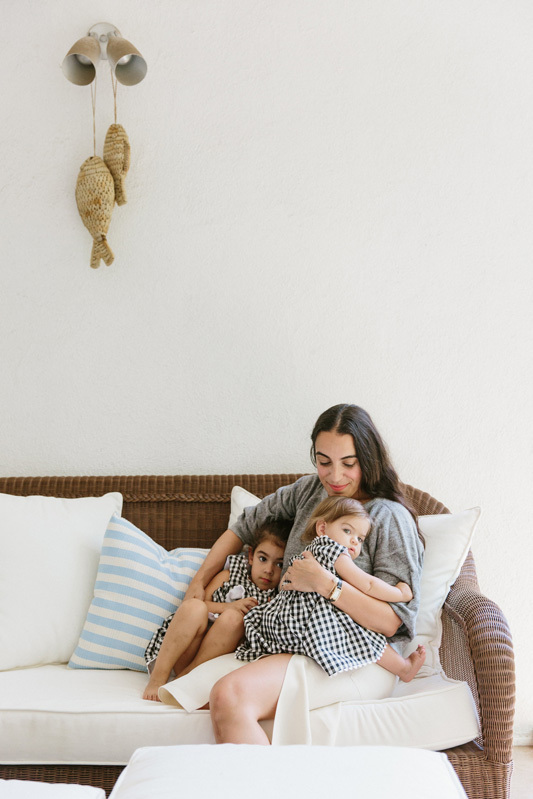 Below, we go deeper with the textile designer behind Heather Taylor Home and mother to Scarlett, 3 1/2, and Goldie, 13 months, as she opens the doors to their color and art-filled home and discusses motherhood, style, going from 1 to 2, and finding that elusive “me” time. Enjoy! 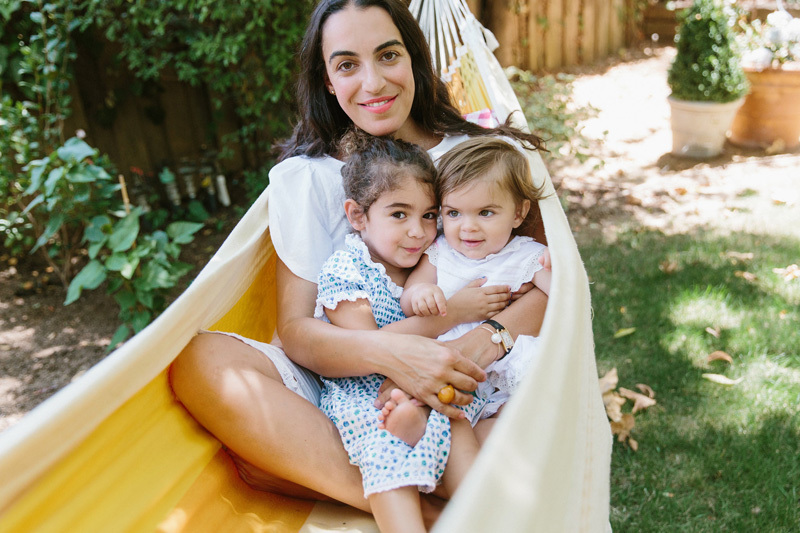 "We moved in almost a year ago, last September, when Marigold was just two months old. I think that because I was caring for an infant while moving, the whole process has been a blur and it’s taken me longer to get settled. But it’s finally starting to feel like home. We wanted more space and we also wanted to be some place more peaceful. 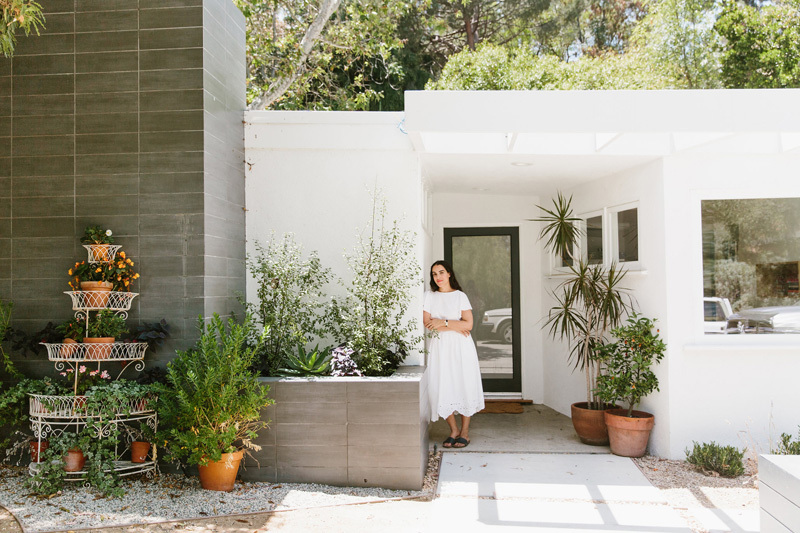 Our last house was smack dab in the middle of Hollywood." Heather wears a top from Korea, vintage skirt, and Beatrice Valenzeula shoes. 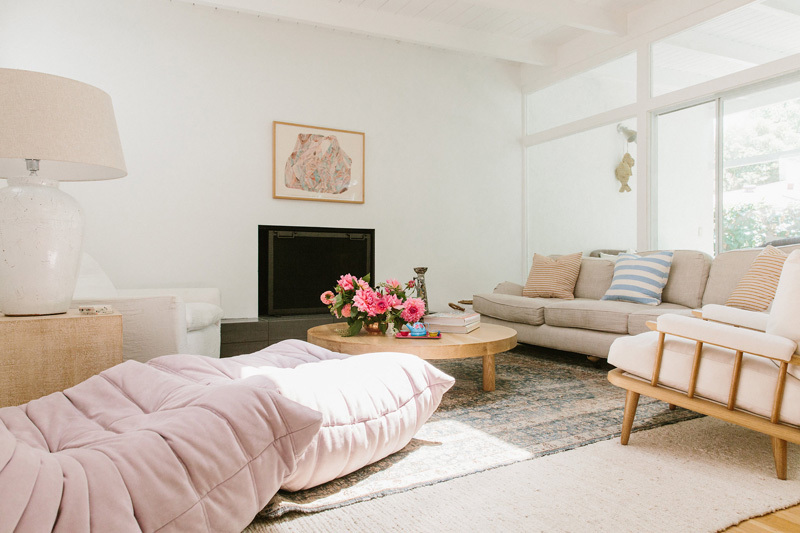 "Clean lines, soothing colors, relaxed, relaxing, and—most importantly—cozy." "Yes, we completely gutted the kitchen and made a more open floor plan in between kitchen/dining and living room." 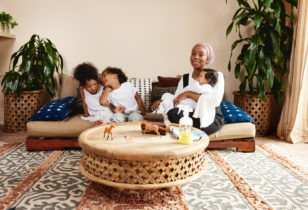 "The room still isn’t done—I still feel like we just moved in—but I wanted it to be a cozy space that would be equally good for kids and adults. The lavender chair is Ligne Rosset and it definitely ties the room together. 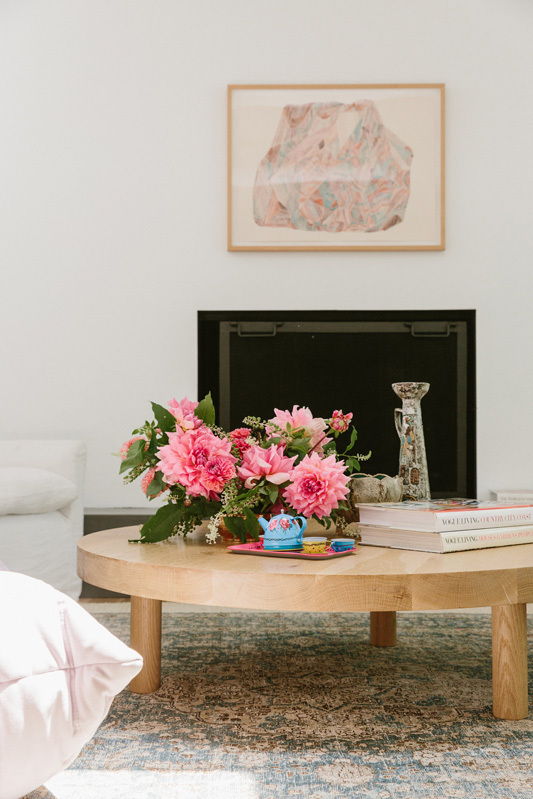 The round coffee table is from Nickey Kehoe and we joke that it’s Scarlett’s stage." "Only bring things into your home that you truly love." "A little bit of both. 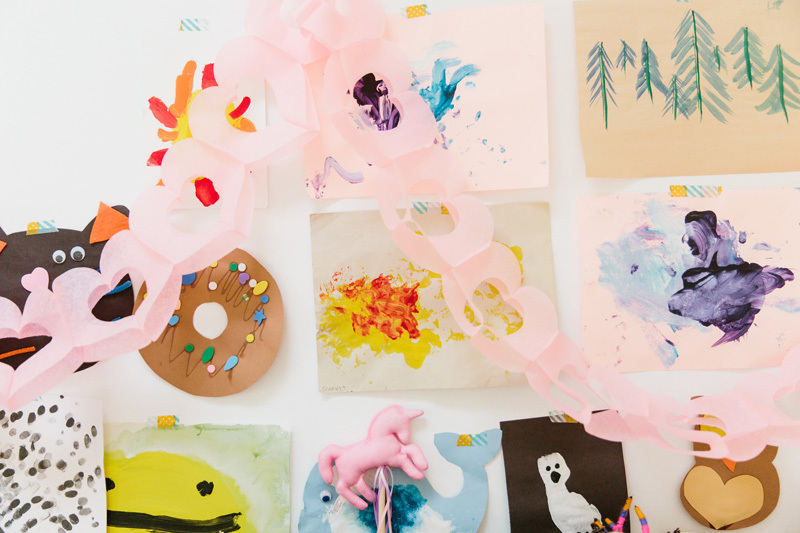 I try to keep most of the toys in the girls' rooms, but I want them to feel free to play everywhere." "We can be outside almost everyday." "Never say never, but I love L.A."
"Clare V and Violet Grey for shopping. Jon and Vinny’s, Felix, and Gjelina to eat. LACMA to explore. And the beach near Malibu." "Goldie" necklace by Jessica Winzelberg. 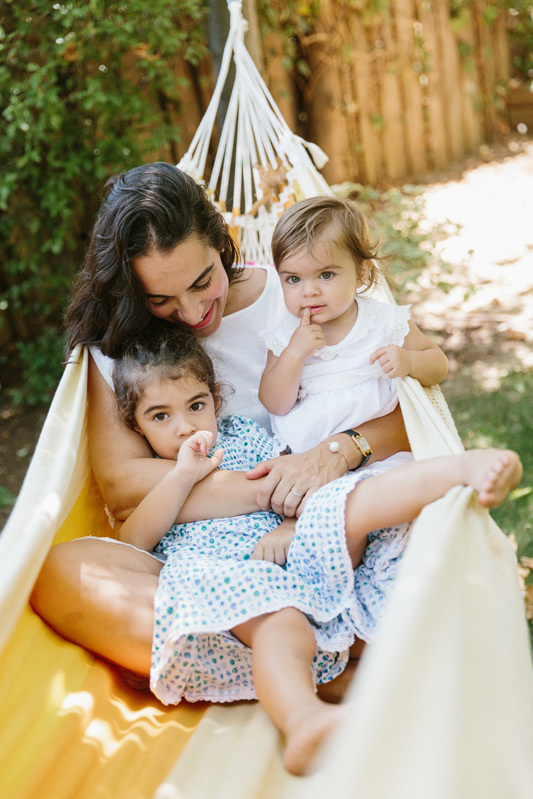 "Watching my girls grow into independent little ladies." 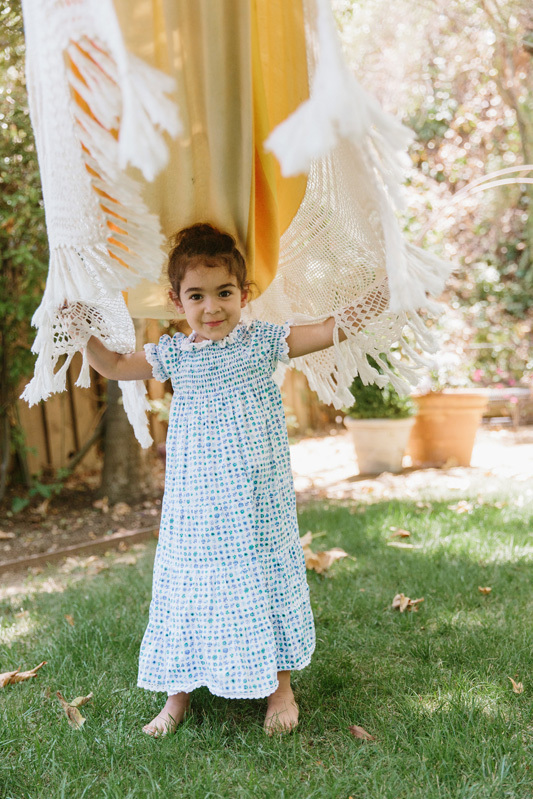 Scarlett wears a dress from Mexico. "Raising kids, specifically girls, in our current political climate." "Everything. My sister is my best friend and having two girls still feels like a dream come true. 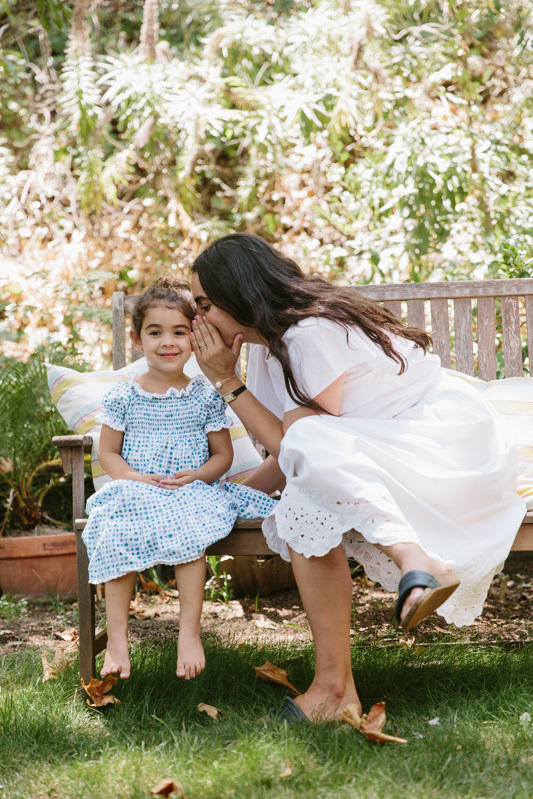 I vividly remember the moment the doctor called me both times to tell me I was having girls." "I loved the name Scarlett ever since I first saw Gone With the Wind and it just immediately felt perfect to me and my husband. Her middle name is Jane, which I love for its gorgeous and old-fashioned simplicity. There are so many great literary Janes. I first heard the name Marigold on Downton Abby and fell in love with it right away. It’s also always been one of my favorite flowers. The nickname Goldie felt like a classic little sister name. Her middle name is Katherine, which is also my sister’s middle name. And both my sister (whose first name is Megan) and Marigold have the initials MK." 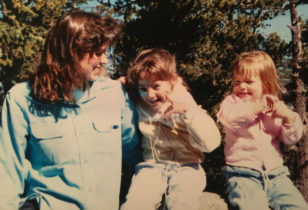 "Yes, all my mom friends who are in the trenches like me, trying to do their best for their kids and for themselves. I think I would lose my mind without this network of support. And of course my own mom who created/creates such a lovely and cozy world for me and my sis, and now my girls." "Scarlett will be 4 in November. 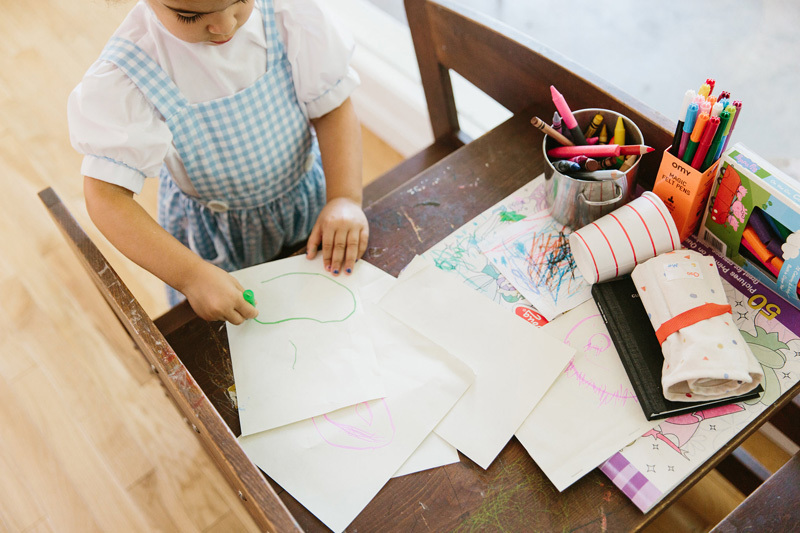 She’s into puzzles, swimming, ballet, stickers, playing dress-up, reading, and Beauty and the Beast. But she’s also very into potty talk, staying up until 10pm, wasting Band-Aids, and trying to take sips of my coffee in the morning. Marigold is 13 months and she’s just on the brink of walking and a language explosion. 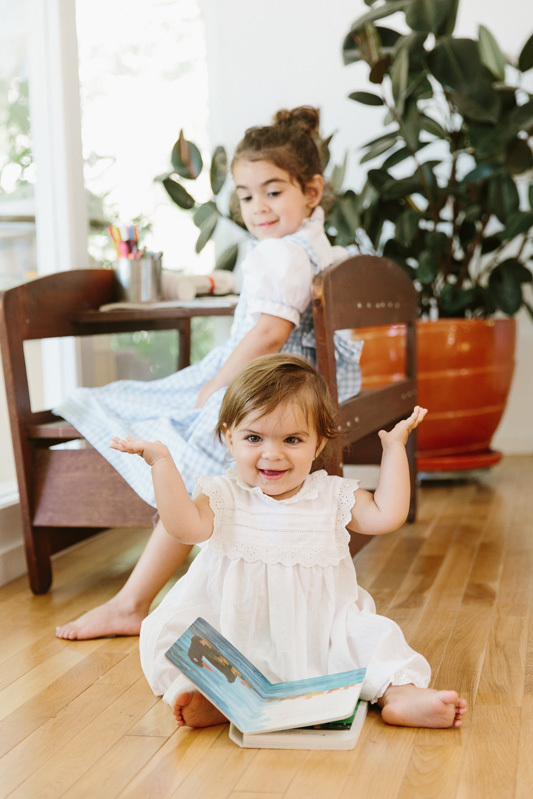 She loves her books, her stuffed animals, and drinking water out of a cup, but mostly she’s into her big sis." Goldie wears a dress by Bene Bene. "I’m not a glowing pregnant person. What’s the opposite of a glowing pregnant person? That’s me. 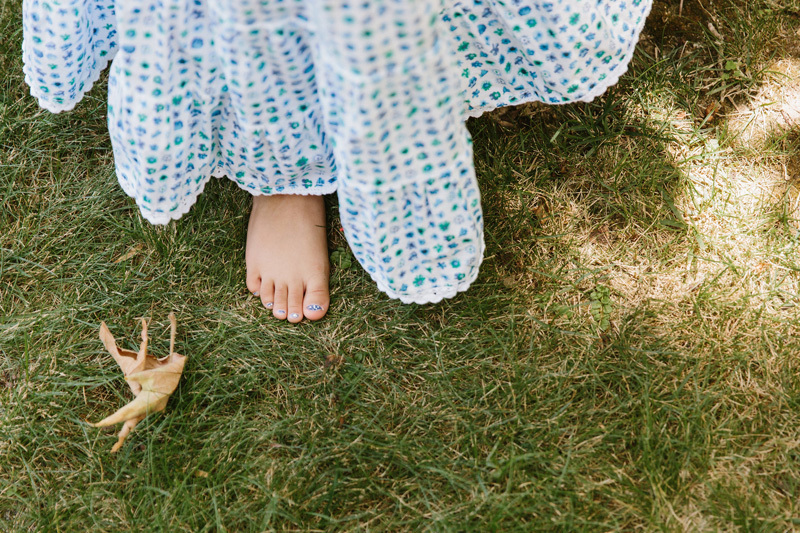 I hemorrhaged during my first pregnancy and spent time on bedrest. 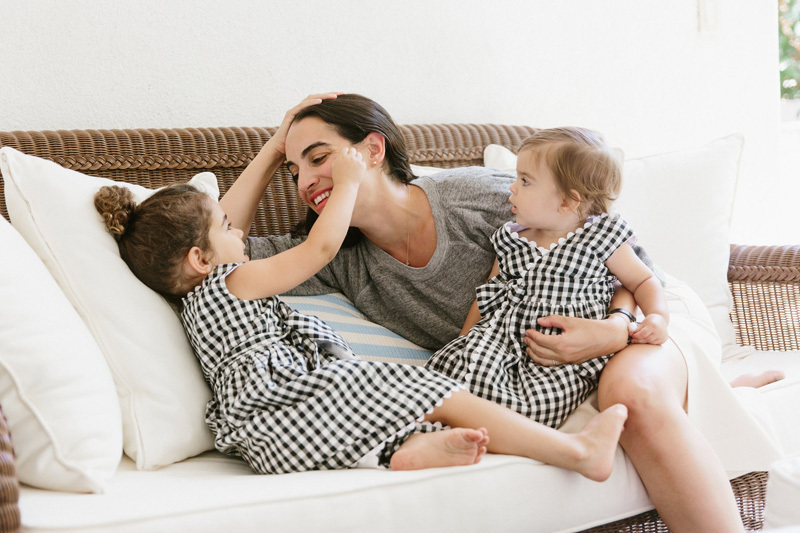 I had three really bad falls while pregnant with Marigold and that caused some complications. Overall, nothing horrible but just very uncomfortable." "When you work for yourself like we both do, it’s very hard to take any maternity/paternity leave. We tried our best to step away but it was virtually impossible." "My husband and I are both fairly relaxed yet trying our best to teach manners and discipline and kindness above all else. We want them to be good people and we want them to have fun. Hopefully we are leading them on the right track." 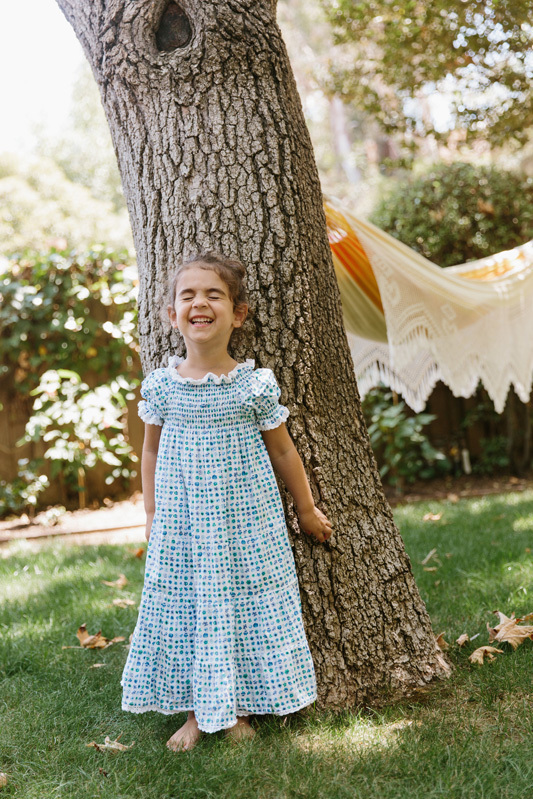 Heather wears a dress by Jeana Sohn. 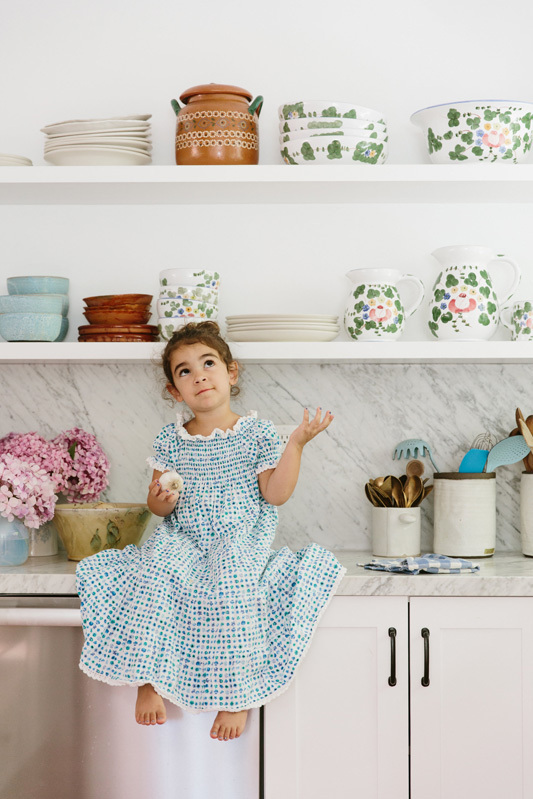 "The kitchen is where I spend most of my time, so I wanted to make sure it felt like a happy space for me. The floors became the focal point but everything else is really clean. 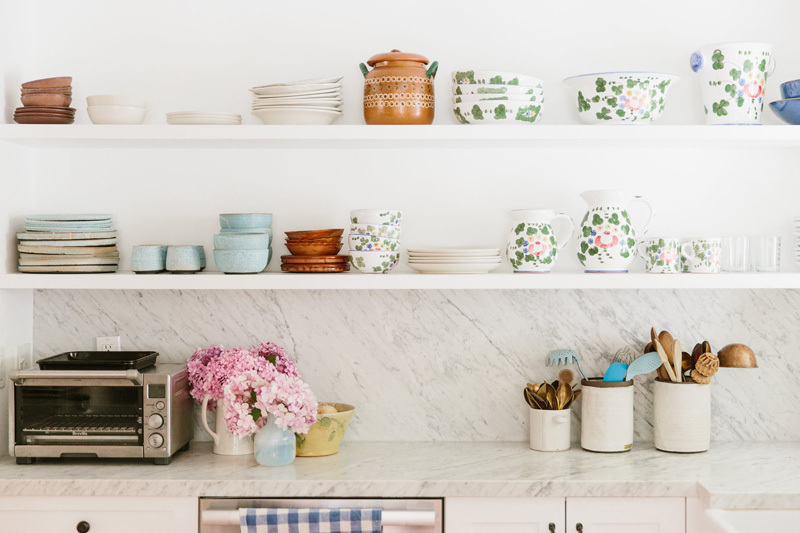 I collect different types of dishes, ceramics, and pottery, and the open shelves allow me easy access to all my favorite pieces." 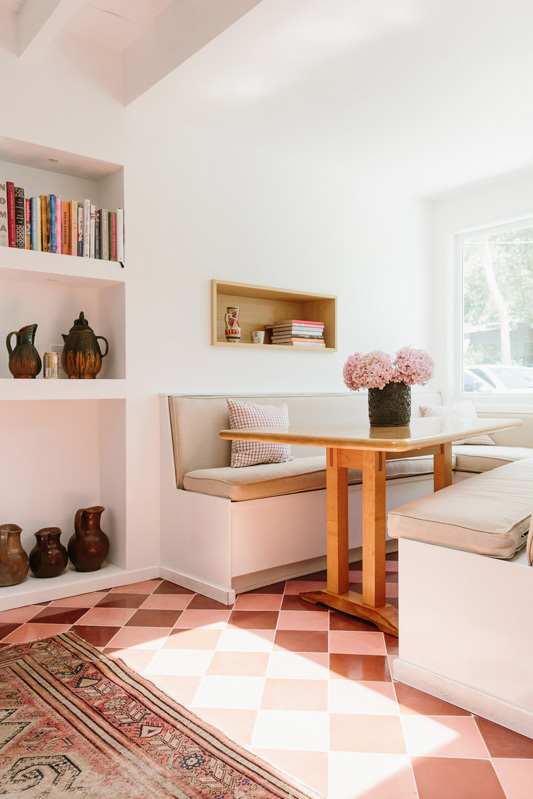 "It's a combination of Adam Silverman, Heath, and terracotta pieces I have picked up in Mexico. 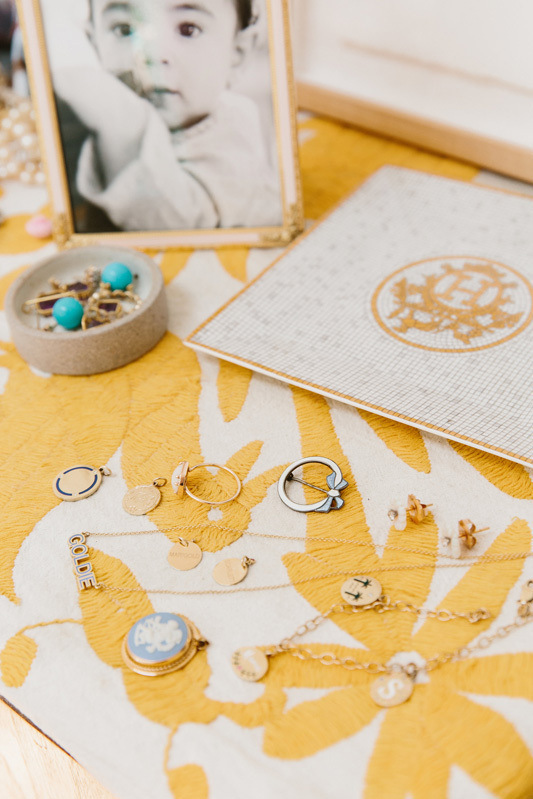 The floral pieces are from Indigo Seas and I have been collecting them forever." "It’s jolted me into a state of eyes-wide-open-awakeness. I’ve always been politically engaged, but it’s made me much more politically active. I know I need to do my part to secure a good future for my girls. The reality of what’s happening in this country is hard to face but it’s critically important for me to be informed." "You don’t need to wash the pump parts every time you use them! Just throw all those little pieces in tupperware and put it in the fridge and you can re-use for 24hrs! This was a game-changer for me and I have no idea why we didn’t know this when we had Scarlett." 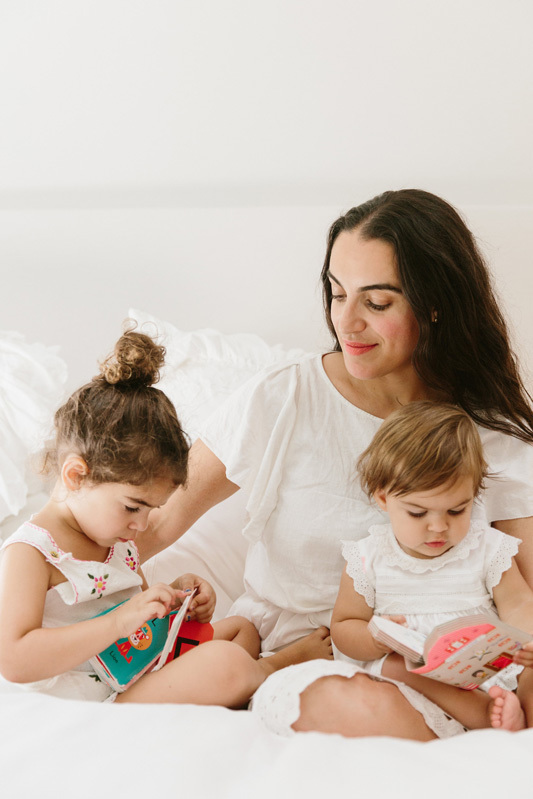 "I struggled with many elements of going from 1 to 2, but mostly I didn’t know how to manage the emotions and needs of both Scarlett and Marigold (and myself) at the same time. Have friends and family around who you can call for help and emotional support." Heather wears an Entireworld sweatshirt, Jeana Sohn skirt, Hermes watch, and Grace Lee bracelet. 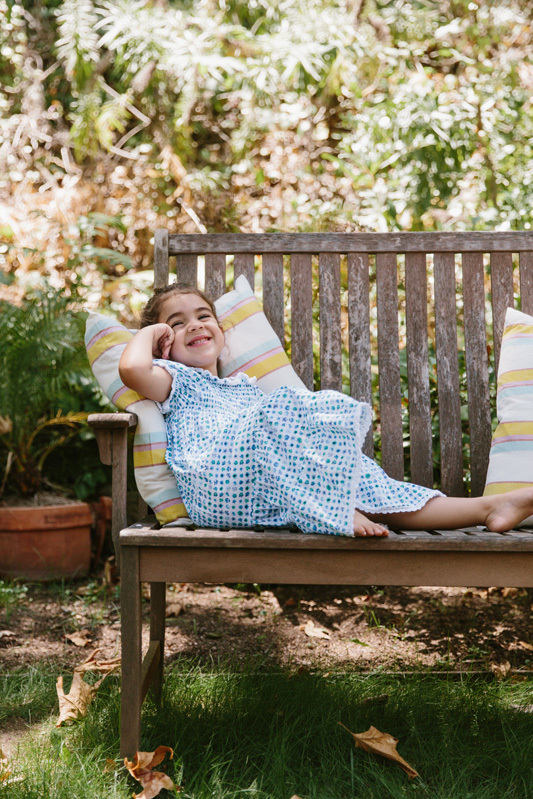 Scarlett and Goldie wear Maman & Moi dresses. 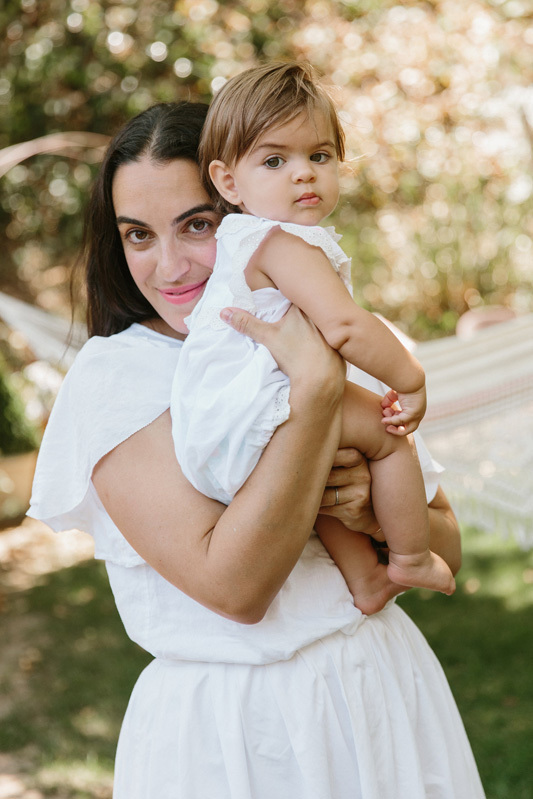 "I loved the book Brain Rules for Babies, which my doula recommended the first time around." 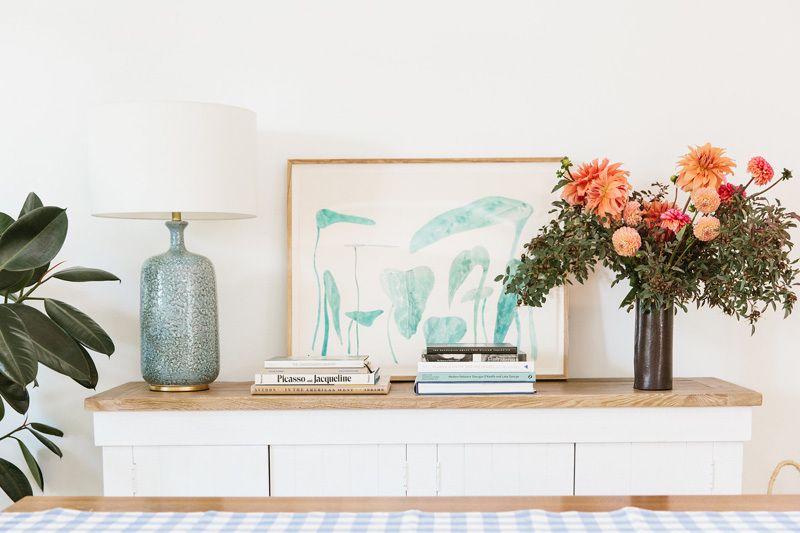 "Classic, eclectic, fun, colorful, comfortable, and easy. 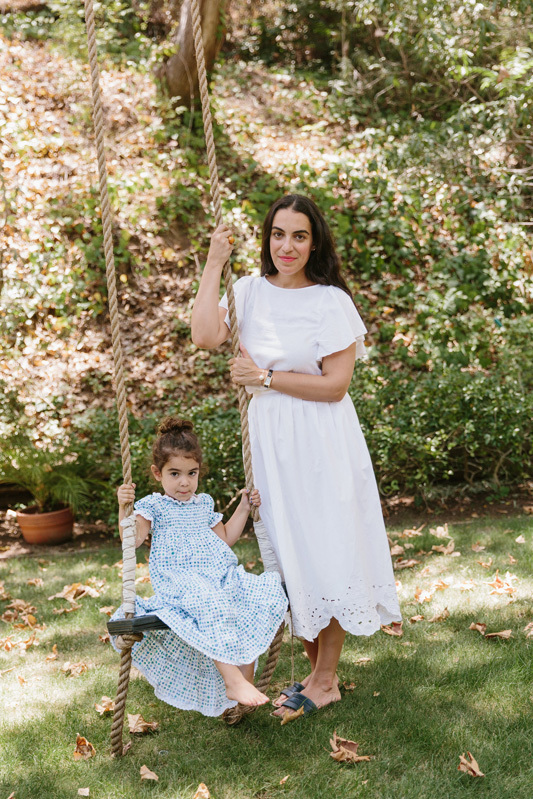 I’ve become more of a uniform person since having my girls." "Definitely white jeans, blue and white striped shirts, vintage shirt-dresses, and cozy sweatshirts. 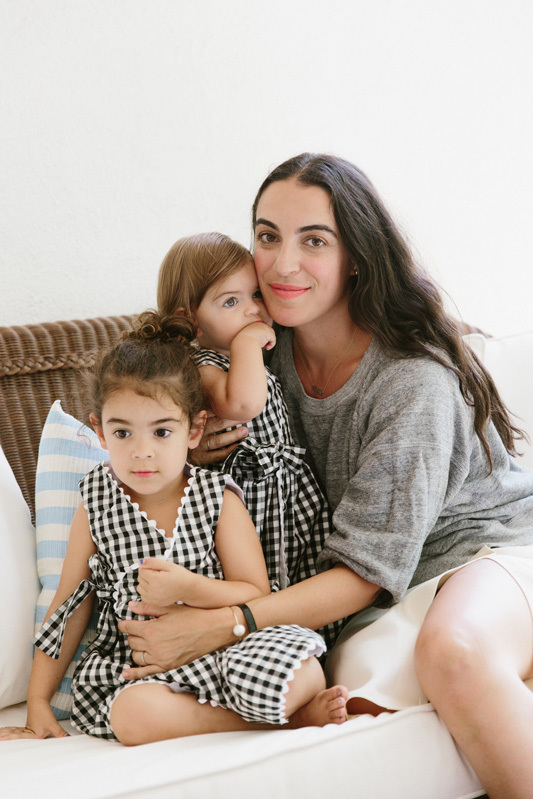 My favorite designers are Jeana Sohn (perfect tailoring), Entireworld (the most perfect basics around), Clare V (the best bags for work/mom life/everything), Grace Lee (delicate, wearable jewels that are great for stacking), and Jessica Winzelberg (the best heirloom jewels)." 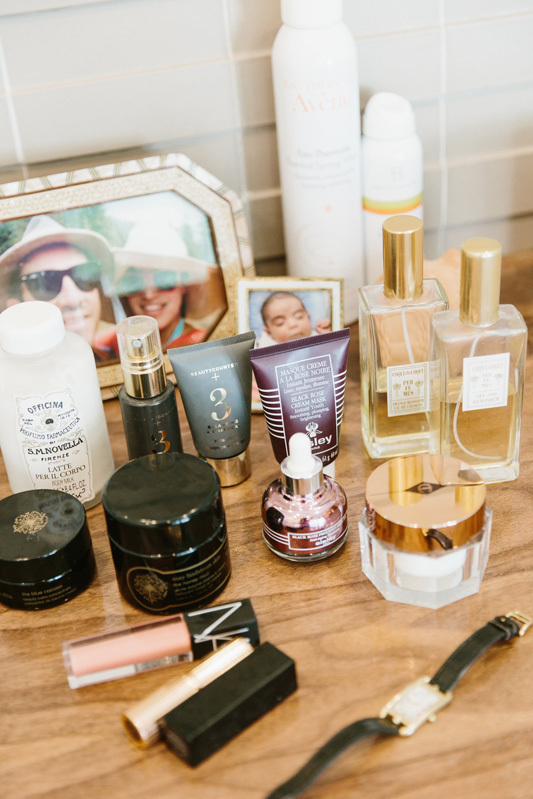 "Since becoming a mom I don’t have time for facials or massages or anything glorious like that, but I have become very committed to my skincare. I love Beautycounter, specifically their SPF and face oils. I love Blue Cacoon and Honey Mud by May Lindstrom. I love lotions and body oil by Santa Maria Novella. I love everything from CAP Beauty. My favorite lipstick is Rosewater from Kosas. I’m also obsessed with their tinted face oil." 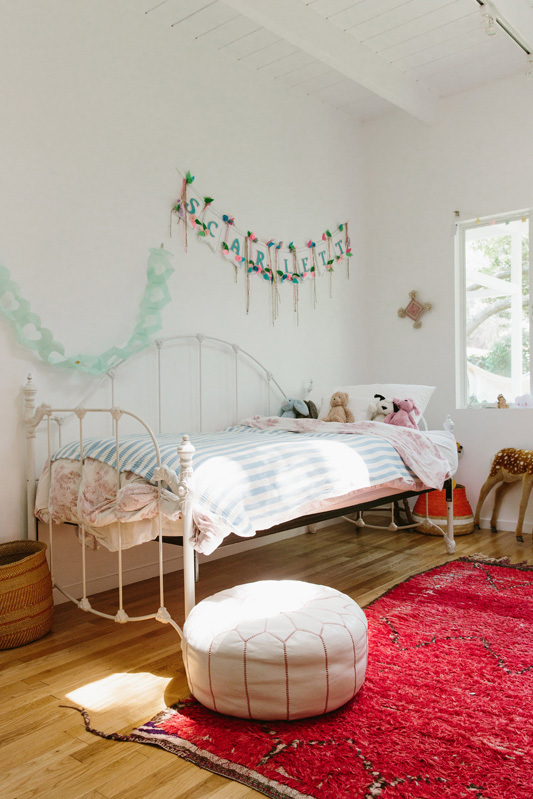 "I want it to be a sweet space for her that stokes her imagination. We bought the bed from Craigslist and it’s exactly the same type of bed that I had when I was a little girl. 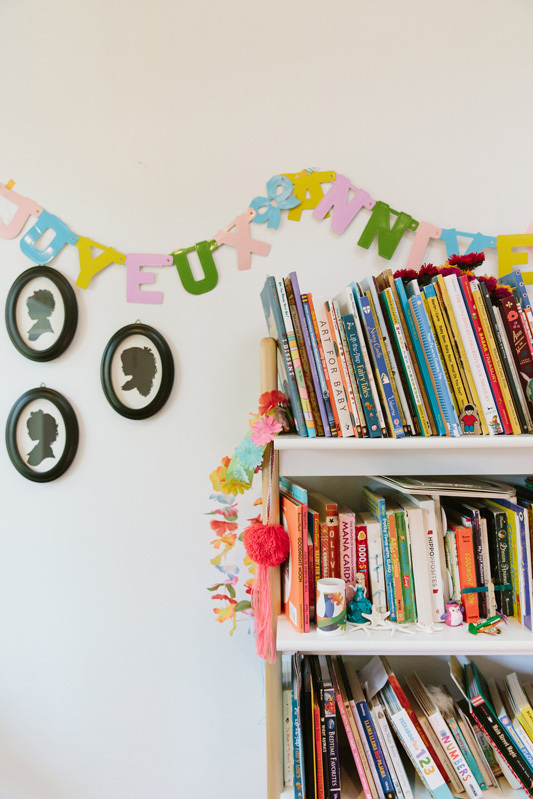 I found the name banner on Etsy." 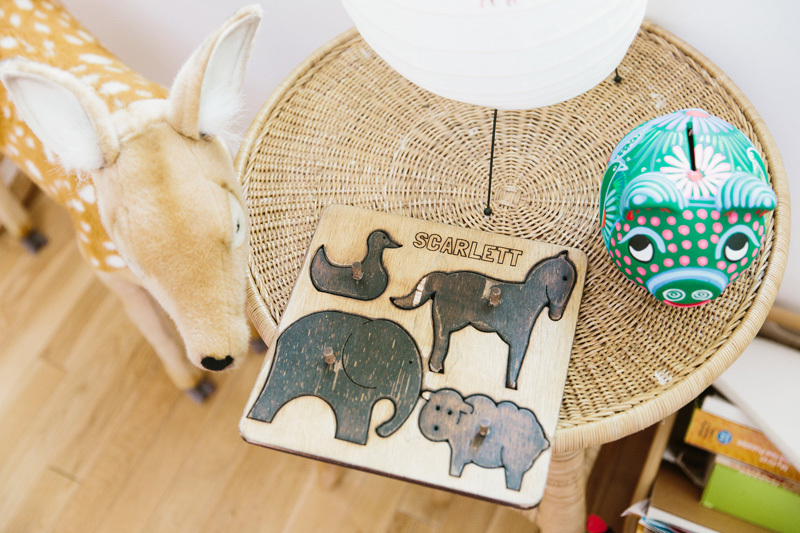 "Definitely the red Moroccan rug, which I bought when I was pregnant and had decided we would be naming her Scarlett. 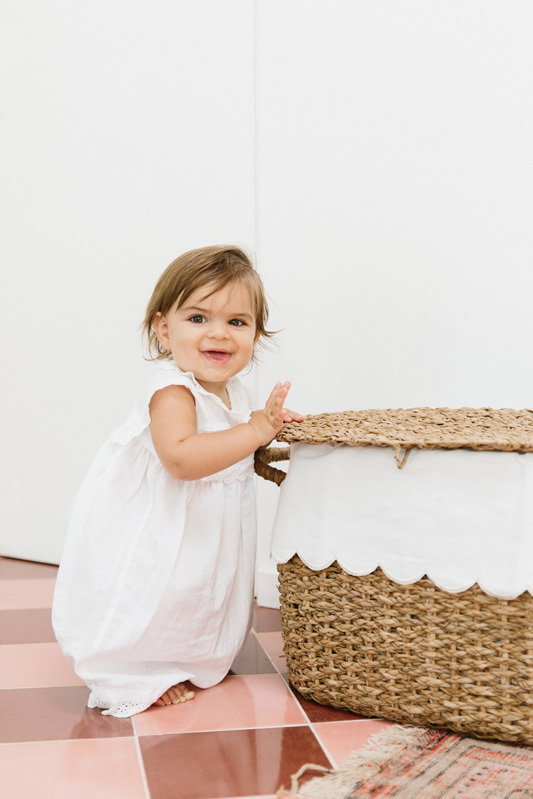 She loves her basket of dress-up clothes." 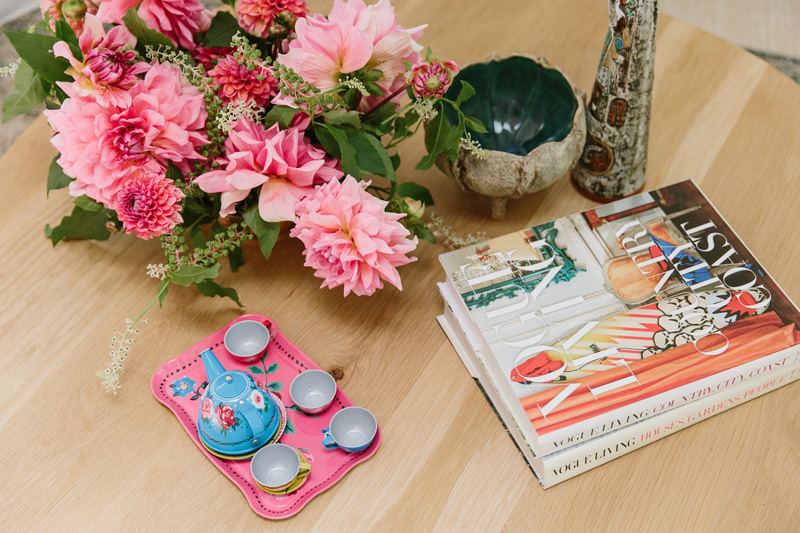 "I have Heather Taylor Home, a line of home goods we design in L.A. and make in Mexico. 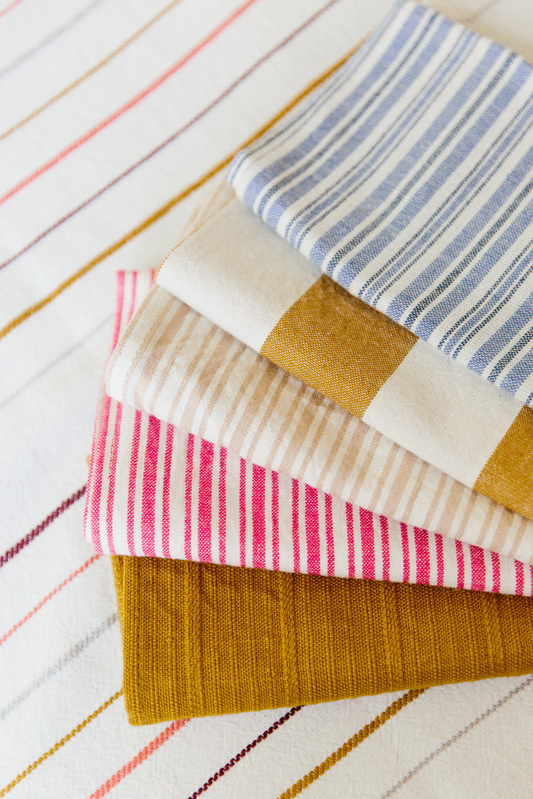 We sell to stores, sell on our website, and also rent out linens for events all around the world. I grew up in L.A., I went to an all women’s college in California, called Scripps, where I studied Art History and Media Studies. Both of which are coming in pretty handy right about now! 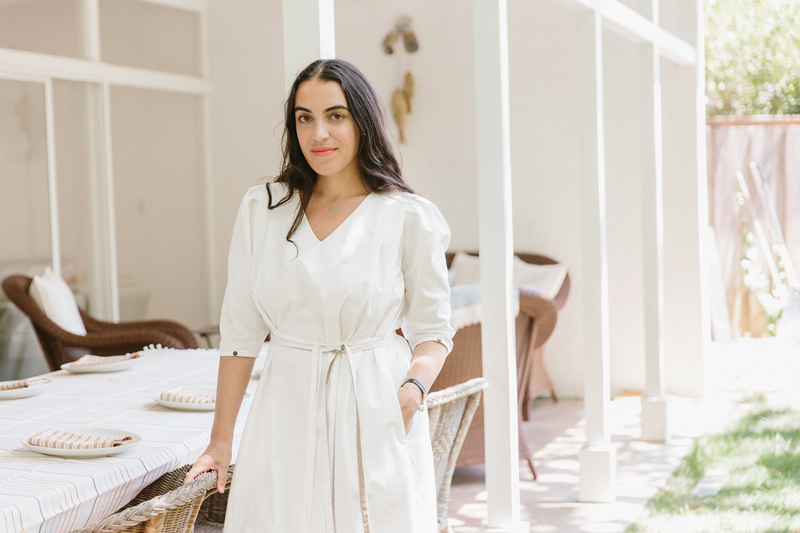 I worked at an art gallery in NY right after college and then I moved back to L.A. and worked for a movie producer where I had a Devil Wears Prada-type of experience." "I’m very lucky that both sets of grandparents are here in L.A., along with my sister and her husband. They all help us so much. 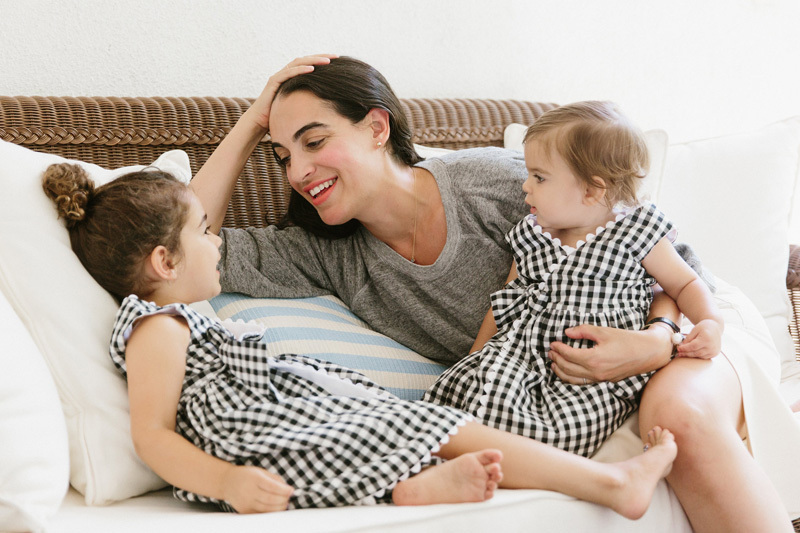 We also have an amazing nanny who has been helping with my girls since the beginning." "It’s hard/impossible for every single woman I know, myself included." 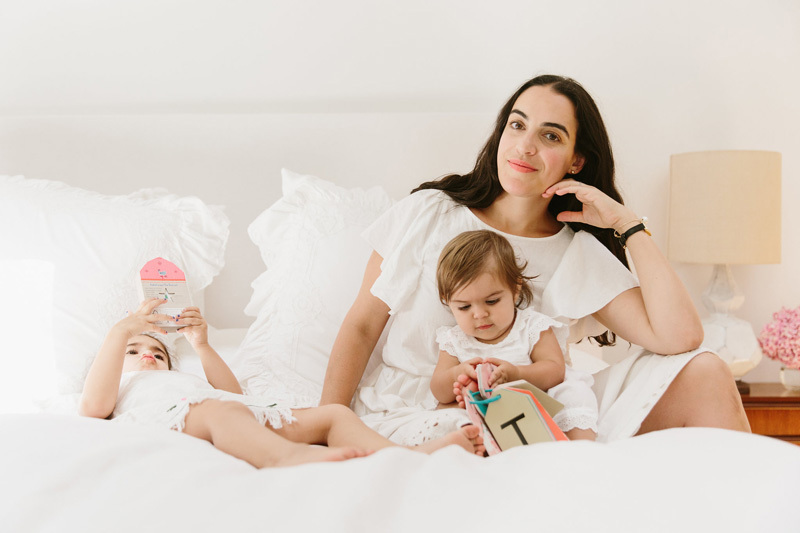 "I deal with ‘mom guilt’ daily and I combat it by talking to my mom friends who I know are struggling with the same types of issues. 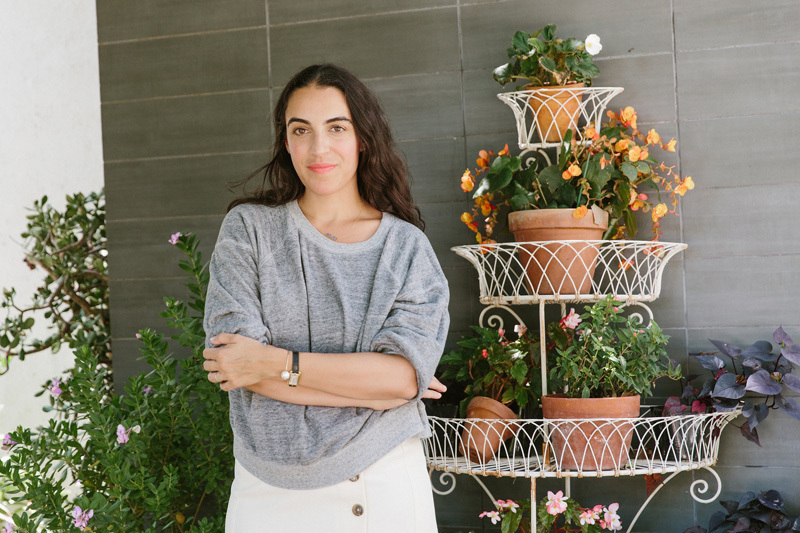 I can not stress enough how crucial it is for me to have my support network." 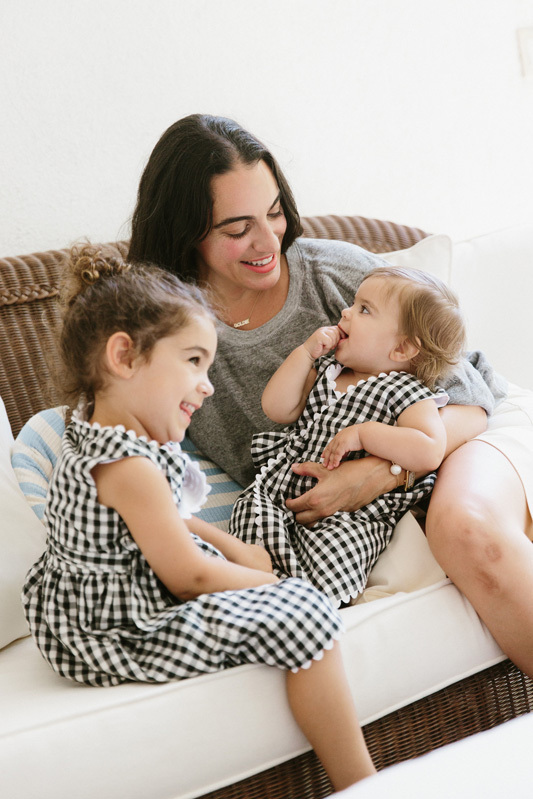 "I’m more motivated than ever to work hard and be a good person for my girls. I have to lead by example." Heather wears a Jeana Sohn dress and Jessica Winzelberg "Goldie" necklace. "I’ve always loved working out and I feel like a crazy person when I’m not doing it regularly. I do this fun trampoline, dance workout called LEKFIT a few times a week and do yoga when I can." 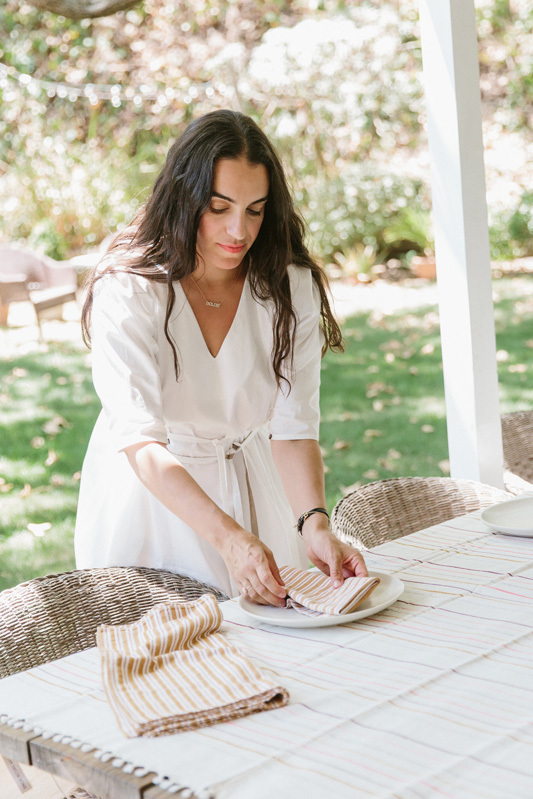 Setting the table with Heather Taylor Home textiles. "Between work and the girls I struggle with this, but if I can get out for a movie, a manicure, or a glass of wine with a friend I feel like I’m winning." For more on Heather, her business, and her family, follow her on Instagram.